Charlie Kaufman's "Adaptation" was a delightful and twisted look at the hardscrabble business of screenwriting in Hollywood and, yet, as much as I enjoyed it I honestly feel that "Sahara", a yarn about adventure maven Dirk Pitt (Matthew McConaughey) on the perpetual hunt for an ironclad Civil Warship with gold stowed away aboard it buried somewhere in the African desert directed by the son of Michael Eisner, is an even more accurate portrayal of this process that is so near and dear to my heart. I can sense some detractors out there who do not share my opinion. It doesn't know a damn thing about the process of screenwriting, you're saying. It involves motor boats blowing up, you're telling me, and noisy gunfire and camel chases and a pre-"Office" Rainn Wilson and a secret plant in the desert our main characters break into which contains, as the esteemed Roger Ebert noted, "James Bondian vantage points...from where (the characters) can observe uniformed clones carrying out obscure tasks." Al: "Well, we're in the desert, looking for the source of a river pollutant, using as our map a cave drawing of a Civil War gunship, which is also in the desert. So I was just wondering when we're gonna have to sit down and re-evaluate our decision-making paradigm?" Dirk: "I don't know. It seems to be working so far." I'm not sure there has ever been a cinematic exchange that has so succinctly summed up the tinseltown script process. Seriously, tell me that Al doesn't represent one screenwriter pointing out the plot's complete lunacy and that Dirk doesn't represent the other screenwriter merely dismissing this well-reasoned outrage with a wave off his hand. In fact, this is a real possibility. The author, Clive Cussler, of the book series on which "Sahara" was supposedly "based", and who was one of ten (I repeat: ten, one ahead of "Armageddon's" infamous nine) screenwriters on the film, actually sued the producers for a breach of contract stating that he was not given final approval of the script. But this development only lends more credence to my hypothesis. Consider the sequence when our heroes finally do happen upon the ironclad ship they seek (and, for God's sake, don't presume I gave anything away with that revelation - of course they find it) and, with the bad guys bearing down on them, Dirk decides their only option is to open fire with the ship's long-unused cannons. Al: "It hasn't been fired in over a hundred years! It'll never work!" Can't you picture the writers parrying every Cussler objection with "Why not?" and then Cussler heaving hotel vases out the window? Cussler: "Wait, why would the evil Frenchman's henchman stay behind at the plant to try and push Matthew McConaughey off the helicopter pad when the whole plant was about to blow up in two minutes?" Partly that's what fuels my love of this movie. It feels like we're truly getting a glimpse at the re-writing practices of Hollywood. It's as if the movie itself is being re-written as it unfolds before us and it's pretty darn amusing to see how idiotic these fourteenth and fifteenth drafts can be. There is one moment of such lazy plot advancement it made me laugh so loud in the theater the person sitting in front of my friend Dan and I turned around to look at me. Okay, so our heroes find themselves in a camp of people in opposition to the evil African war lord who is poisoning the continent's water and causing a plague and....so on and so forth. Whatever. Your typical stuff. The point is this: Steve Zahn is playing soccer with a group of kids and, suddenly, the soccer ball goes awry and bounces off to the left and away from Steve Zahn and then bounces down a steep, rocky incline and keeps bouncing and bounces down into a cave and Steve Zahn enters the cave to retrieve the soccer ball and then, gasp, looks up and sees something on the cave wall and, wouldn't you know it, it's a map providing the location of the very Civil War ironclad ship which Matthew McConaughey has been seeking all these years! I mean, this moment is brilliant. It is just unfathomably brilliant - in so much as it represents every single thing that is wrong with writing in the movies. Yet it is so obviously bad I sometimes wonder if it was on purpose. It's like a language arts exercise in middle school where you are asked to identify the correctly structure sentence and the incorrectly structured sentence and the incorrectly structured sentence is spectacularly incorrectly structured just to ensure that every student understands. This scene of the bouncing ball leading to the map might very well be the worst written scene in the whole history of the written word. You just can't write that and not know what you're doing. You can't! It's not possible! You have to know! You have to! You don't talk to strangers and you do not, under any circumstances, have a soccer ball bouncing down a steep incline and into a cave allow for the discovery of a film's most crucial plot point. If the writers had explained this to noted screenwriting guru Robert McKee his entire body would have just gone up in flames. Yet, what's most baffling is the fact that "Sahara" actually contains one passage that is perfect screenwriting! I swear! With Dirk and Al trapped deep in enemy territory their benefactor (William H. Macy, chewing on a cigar at all times) summons some guy played by Delroy Lindo (I don't even remember who he was or where he came from and I really don't desire to take the time to look it up) to get them out. Lindo says not a chance. Lindo walks away. Macy says this: "October 27. 1982." "Oh yeah," Lindo replies. "I knew you'd bring that up." "And now I have," says Macy. And based on this Lindo agrees to save Dirk and Al. Except the movie never tells us what happened on that date and it shouldn't because the characters already know what happened and would have no need to say it aloud. It's akin to a sterling passage at the end of the brilliant "You Can Count On Me" when Mark Ruffalo's brother asks his sister (played by Laura Linney) at an emotionally charged moment, "Do you remember what we used to say when we were kids?" And she says, "Of course, I do." And they never say what it was they said because they wouldn't because they already know. How in the hell was "Sahara" smart enough to do this but stupid enough to do everything else?! They had to know what they were doing, is the only answer. They injected this little nugget of good writing into the middle of all the madness just to see if anyone was paying attention. That's my theory, anyway. I'm probably wrong. In fact, if I were in Vegas I would bet against myself. Not that it matters. 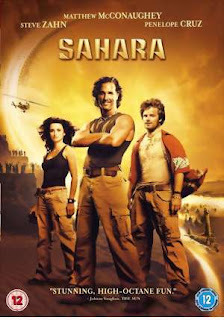 Intentional or not, "Sahara" would be fantastic instructional tool for aspiring screenwriters. Look, kids, this is what not to do. Okay? If you still haven't seen it, you should add the TV series Action to your Netflix queue. It's only 6 episodes long, and worth it just for the screenwriter's story arc alone (and as a bonus you get Jay Moore in the best role he's ever had). I haven't seen it. Thank you, sir. Consider it netflixed. great post on screenwriting and a 5star film. a note - i did a web search for cia activity on the mentioned date, and found a record of activity in nicaragua then. and that country was mentioned in the film. who knows, maybe the screenwriters did their research.